We found Sleeper Soles and we knew we had to share this gem with you! Sleeper Soles are are skid-resistant, iron-on suede leather soles for children’s footwear and socks. 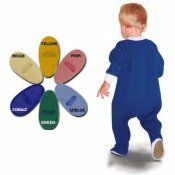 They provide great traction, but won't wear or wash off like the tread applied to many kinds of sleepers or "slipper socks" and are an easy and economical way to make new or used baby, child sleepers and socks safe to toddle, walk, run and exercise on tile, linoleum, wood, concrete and other hard flooring. •Sleeper Soles are the first and only iron-on suede leather appliqué specifically designed to prevent potentially fatal slipping accidents. They outlast and outperform the so-called "tread" applied to many types of sleepers and socks. •Sleeper Soles are easy and economical - you can make new or used footed apparel safer while allowing baby's feet to breathe. •No more need to put treaded socks over baby's already covered feet, making them extremely hot and sweaty. •Sleeper Soles are completely washable and dry cleanable. There's finally a solution to no more worrying about your toddler slipping!